Let’s face it, we are not the most considerate or well mannered of people. If there is a rule to be broken, a line to be cut, or a traffic light to be jumped, you will likely find an Indian elbowing his way to pole position. Any indignant readers quick to rush to the defense of fellow citizens, are either too privileged to have had their toes crushed at supermarket checkout lines, or are most likely ABCD’s (‘American born confused desis’)! Just so you know, acronyms are another obsession of ours, apart from the breaking of rules that is. Our ruling Bollywood idol is SRK, its aging supremo, BigB, our new prime minister: NaMo, and our blockbuster movie titles no doubt chosen with abbreviations in mind……just try Googling QSQT or DDLJ or YJHD! This post is about one of few cities in India that has historically belied that norm and is synonymous with refinement and graciousness. Its ‘pehle aap’ tehzeeb (‘thou first’ culture) best epitomized in the story of two local Nawabs, who miss their train in their insistence that the other get on first! 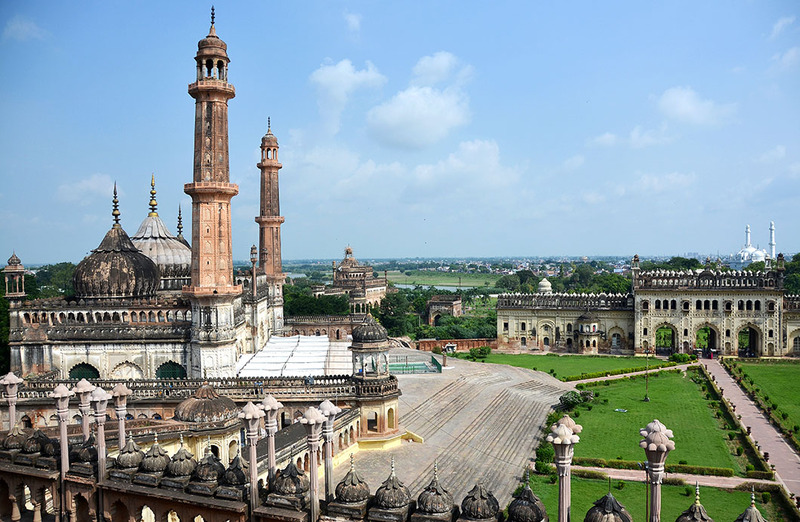 The capital of the most populous state in India, and situated 40 miles West of Ayodhya, the birth place of the Hindu God Ram, Lucknow is said to have been a gift from Ram himself, to his loyal brother Lakshman. Hence the name Lakhanpur (later Lucknau and the British Lucknow). But any recorded history of importance only dates back to the (14th century) Delhi Sultanate. The reality is vastly different from that thirty three year old screen rendering of course. The streets are filthier, the monuments not as spiffy, and the once impeccable zubaan (speech) vastly diluted, at least on the streets. Still, the courtesies are evident in the respectful greetings of ‘adaab‘ and the genuine amity between Hindus and Muslims. This is supposed to be one of few places that has resisted inter-religious strife, and where both communities celebrate Id and Diwali with equal fervour! I was surprised to learn that Urdu, the lyrical language that the locals hold dear, wasn’t an Islamic import at all, but a highly refined, home grown hybrid of pre-Islamic Persian, Arabic, Sanskrit and Hindustani dialects that embodied the composite culture of the region. And that its best scholars were Hindu! It eventually replaced Persian as the official language in 1837 (along with English). But partition sadly destroyed its communal nature, permanently associating (Persianised) Urdu with Pakistan and its Sanskritised form – Hindi – with India. Gate to the Qaiserbagh Palace complex that housed the royal harem. (‘Bagh’ is garden, and Lucknow boasted many landscaped parks) The palaces within Qaiserbagh were destroyed by the British after the rebellion, and roads cut through it. The romance of that urbane speech lingers. Fueled by immortal poetry and music (and Bollywood of course!) that extol the cultural togetherness of a gentler time. And Lucknow is one of the last bastions of that pure spoken word, as well as the harmony. The latter under serious threat from politically induced violence in the towns surrounding it. 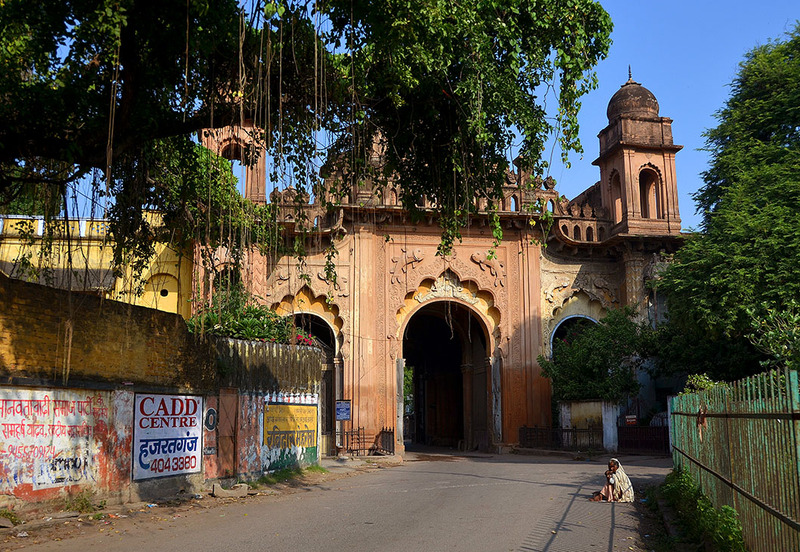 Lucknow’s other claim to fame, is the prolonged siege of the British residency during the 1857 Sepoy Mutiny. Some of the fiercest battles of the rebellion were fought here, as proved by the 18 Victoria Crosses awarded to the officers of the Company for action in one single day, and 28 for one single action. A sad record that still holds. A lone memorial commemorates the sacrifice of thousands of rebel lives. The forlorn shell of the abandoned residency houses a small memorial museum. The murder of the last king – Nawab Siraj ud Daulah – at the end of the war, tolled the death knell for the leisurely Nawabi lifestyle of Awadh, or Oudh as the region was known then. Successive uninspired regional leadership leading up to the present, ensured it never regained its past glory. And the fact that several Prime Ministers hailed from the state made no difference whatsoever. We had one full day to experience as much of the history of this laid back city as we could. And with the help of Sri. Naved Zia, we set ourselves a comfortable pace including a walk in the old ‘chowk‘ area and some sampling of legendary local fare. Our first hotel, uncharacteristically chosen on the advice of a local travel agent, turned out to be dire. So we shifted to the nouveau Nawabi environs of the Taj Vivanta. Still haven’t made up my mind which made the dent in R’s wallet more bearable: their tehzeeb or their gilawati kababs. aap ki tasveer kashi ka jawaab nahin Madhuji!! It may not be like its glorious past but at least its courtesies remain. I hope the religious and political strife don’t rob this lovely old place of what makes it unique. Knowing how well you research a place beforehand, it is nice to know you were in for some surprises, too, especially with the language. Your move to a different hotel looks like it was the best of all splurges as well as the delicious cuisine. I feel I must see more of India and Lucknow would be included. Your personal thoughts and accompanying photography is a draw. Your streets weren’t all that bad actually…in fact I thought the Chowk area was way cleaner than Chandni Chowk in Delhi. Possibly because of the sprucing up in 2010? Have reserved photos from our walk for another post. I do hope the development plans come through. Lucknow certainly deserves a break. As usual, wonderfully written. Perhaps I should include Lucknow in my itinerary. Thank you very much Grover. Lucknow, being less touristy, is a naturally less frenzied and relaxing destination. I think you should include it if you plan to visit Agra and Varanasi. Beautifully written Madhu, a pleasure to read. I love the soft, warm colours in your photographs too. Thanks Suzanne. Those buildings all ooze history. What an interesting post Madhu. I smiled when you told us about the acronyms – not something I knew about. Wonderful photos from this magical place, Madhu. I travel a lot with you! It is my pleasure to have you along Bente! Hope your weekend is going well. Madhu, your first paragraph really struck me, in a good way, as how you describe Indians are like how I would describe Indonesians. That reminds me of the article I shared with you a few weeks ago. Some people here say rules are made to be broken, sounds familiar? 🙂 About the acronyms, James was actually quite amazed (and probably bewildered) when he found out that Indonesians have penchant for acronyms. We call our current president SBY and the president-elect JokoWi, the airport at Jakarta Soetta (from Soekarno and Hatta), and our celebrities names like KD, NickSap, and JuPe. And, believe it or not, my full name is also an acronym! Speaking of Lucknow, it’s a city that first picked my attention many years after I learned about Delhi, Calcutta, Madras, and Bombay. I don’t find a lot of coverage on the city from travel bloggers or news media, so this post of yours definitely quenched my thirst. Not only that, your photos and description assured me that it’s a part of India that should be high on my wishlist. And to learn that Urdu originated from Lucknow really blew me away! You’ve educated me yet again on some wonderful history. Your first paragraph made me smile, and also think of how similar Indians and Mexicans seem to be. 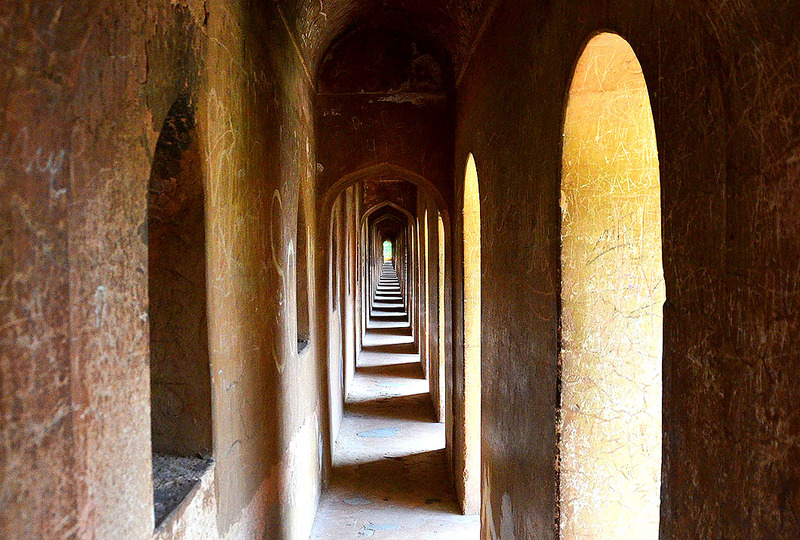 In my younger days, we would usually bypass it on our road trips, and my only visit to Lucknow was to the IIM campus… so it was great to experience the real city through your beautiful words and photographs. I do remember the awesome gilawati kebabs, and of course the delicious motichoor laddoos, which relatives staying in the city would always carry along on their visits to Delhi. Hope you got a chance to try those! Sadly no, there was a limit to the amount of food we could consume in a single day. The gilawati kababs (I realised I didn’t spell it the UP way! Have edited it 🙂 ) we ordered every chance we got! they were matchless in taste and texture. Ah, but there’s still some semblance of that past glory, and Urdu will always hold a special place in the hearts of the people there. Kipling certainly lavished his literary talents on the Urdu speaking north. Stunning post as usual, thank you for sharing. Madhu with each of your posts about India, my desire to visit your country is becoming bigger and bigger. You are most welcome Cornelia. I am happy you enjoyed this. I hope you are able to visit India someday soon. Loved Lucknow when I visited last. Though I had been to only the British quarter, I was awed by its beautiful structures. Well written post, Madhu. Yes Sonel, but in a forlorn kind of way. You can almost hear the tinkle of anklets if you listen hard enough 🙂 Thank you for your lovely comment. I’ve always had a romantic picture of Lucknow in my mind Madhu, thanks to you it remains that way! The romance endures Gilly. Its presentation is wanting. The possibilities sadden me. Your words have extra tenderness and a touch of sadness in this post, Madhu. The pictures are fabulous, and hint at the grace of a forgotten era, or the pathos of soft filigree textures in a new and alien time. Lucknow is all the more amazing for its ordinary people. They live ordinary lives, but with a shadowy remembrance of their regal legacy. Whenever I visit my sister there, I observe their courtesy, old-world gestures, that timeless wafer of a bow as they say ‘adaab’, and it almost breaks my heart… truly, I know then what it is to I feel like ‘a bull in a china shop’. Thank you Meenakshi, means a lot, especially from a UPite! 🙂 The sadness automatically seeps into my India posts, brought on mainly by the neglected possibilities of our heritage sites. Not just in terms of preservation and appreciation, but as employment opportunities as well. Fascinating … especially because I know so little about India. Brilliant coverage on Lucknow a place which now most of us take for granted. Great to read of its awesome heritage going back to Ram and Lakshman. Many thanks dear Madhu for this treat. Thank you very much for your appreciation Dilip. I think it is sad that we take such a culturally rich heritage for granted. Those motifs are further proof of the liberal attitude of the Nawabs of Oudh Jo. Mosques are generally not allowed to portray living beings. What a gorgeous introduction to this beautiful and historic city, one I knew nothing about before! Now I am intrigued! Thanks for all of the wonderful places you share with us through your lovely posts and beautiful photography! Delighted that you do Judy! Lucknow had a special vibe, different from all the other Indian cities I have visited. I’ve wanted to see Lucknow for years and this has only increased my appetite, thank you. Imambara is a shrine, usually used as a gathering place where sermons are delivered during festivals. The small one was exquisite! It is newer as well. Thanks for the explanation Madhu. The pictures, the history and the current here and now and great, giving a glimpse into a world most of us will never have the opportunity to experience. I always am grateful for my visits here, reminding me the world is large and I am small within it. Thank you Sylvia. The corbel detailing is a curious mixture of Indian and European elements….I was surprised by how well it works!. Thank you for taking me on a tour of a place I will never visit now. Is green a common colour for decoration in India? Your view from the balcony is only one of many delights in your collection of photos. Thank you for reading Meg. Green is commonly used in Islamic structures, especially on the domes of mosques. Madhu, I always enjoy your posts about your India. You always make understandable the patchwork of history, cultures, and religions that is India. Makes me want to return yet again. Thank you very much Ron. Simplifying, and more importantly limiting, our complex history to the length of a blog post requires some effort. So your appreciation is particularly gratifying. Wonderful post madhu… city of. nawabs has been captured so beautifully by you. Thanks Divz. Glad you enjoyed it. Lucknow looks and sounds so dreamy, Madhu! The faded glory really comes across in the photos, and as usual, I really enjoyed your fabulous text on the history and the cultural nuances of the city. How sad that Partition divided one shared language into two; if it hadn’t happened perhaps foreign language students would be flocking to Lucknow to learn Urdu! Thank you James. The splitting of a communal language was a minor sacrifice at the altar of nationalistic fervour at the time. The city lost a whole lot more in the immigration of its upper classes and with the influx of outsiders. The depth and complexity of the history of Oudh is hard to fit into a short blog post. If you ever visit, do make it a point to read up on the Nawabs and on the Sepoy Mutiny. It is beyond fascinating and brings these spaces alive. I simply love the historical snippets you provide, Madhu. I know I’ve said this before, but this is what draws me to your posts, as much as your photogtaphy. Marvellous. I didn’t know the name came from the Ramayana – added to my limited knowledge of India. Yes, I’m familiar with the Sepoy Mutiny – as you know, we had a similar mutiny by sepoys in Singapore. Was unaware of the Singapore Mutiny Eric! And surprised to learn that the movement took birth in the US!! Now we are quits 🙂 Appreciate your ever generous and thoughtful feedback. My favorite is the labyrinth image that evokes mastery and wonder. A well researched post, indeed! Thank you for the pictures. They are so mesmerizing. Thank you for stopping by to share your thoughts Sohail. I never get tired of looking at your travel photos.. They leave a song in my heart and a quiet urge to go somewhere again. Do you not do the photo challenges? I only participate in the WP Friday challenge. Have been struggling with time constraints even with my relatively diminished schedule. Looks like a delightful place for a walk! Nice shots too! I have to go next time I’m in India. Our walk through the Chowk was indeed delightful MJF. You should try and plan a visist. Do you come to India often? You write so beautifully, and the images are divine! Thank you very much for your visit and comment D.em. You are amazing Madhu. I live in Delhi but have never been to Lucknow. And now after reading your post I so wish to visit this place! Your prose is beautiful and so are the photos. Always happens Uday. We put off visiting places close to us, precisely because they are so close! 🙂 I have yet to visit Tanjavur for example or Hampi or even Sri Lanka! Thank you for the appreciative comment. Thank YOU for reading Mihrank! And have a great day! That was a really great read! I am definitely stopping at Lucknow the next time I am in that region. Another insightful post 🙂 What I find most impressing is the amount of great shots you come up with every time.